Replacement pucks come with both hook and loop Velcro. Landyachtz Cats Slide Gloves have been specifically designed to be functional and practical. These slide gloves from Landyachtz are perfect for freeriding, because they are light, tough and get the job done! Landyachtz Comic Slide Gloves have been specifically designed to be functional and practical. These slide gloves from Landyachtz are perfect for freeriding, because they are light, tough and get the job done! The Loaded Advanced Freeride Gloves look amazing and super comfortable to wear! The goats leather used in these gloves is extremely supple and gets softer the more they are used. It is this features that really sets these gloves apart from any other glove available. 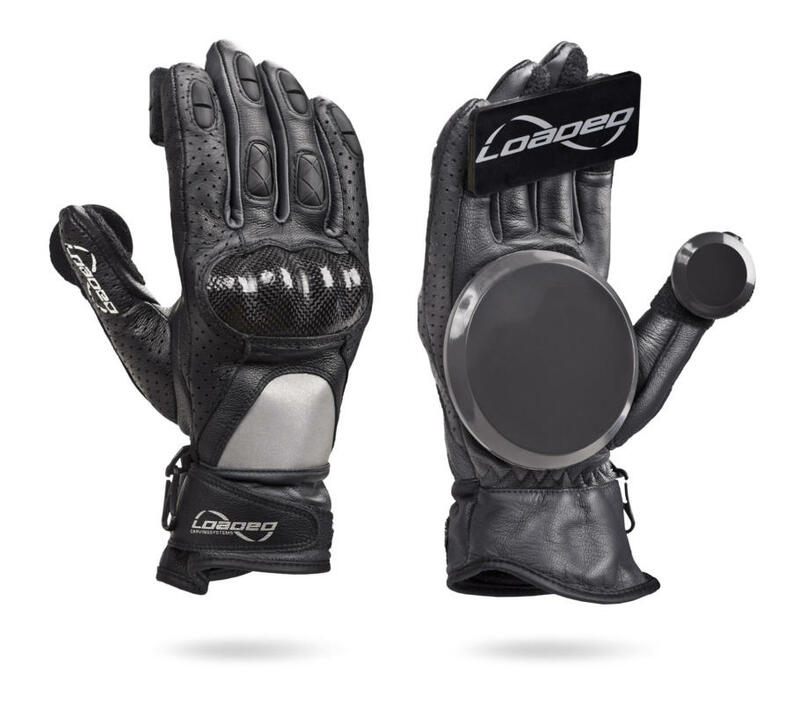 Loaded are so pleased to have created a glove that allows clapping with one hand! Based on your feedback Loaded re-designed the gloves from scratch to make them better than ever: They reduced the profile of the gloves and now offer three form-fitting sizes to better accommodate youth and female riders. Loaded now have a leather racing glove with all the bells and whistles! The second generation of Loaded Race Glove is suited for extreme high speed racing! Carbon knuckle and finger protectors. Breathable mesh top, internal Coolmax® wicking fabric. Velcro palms, finger tips and thumbs. High density finger pucks, All the bells and whistles. Slick, near indestructible, and scented with the sweet aroma of success, Ojoom Pucks are the best way to keep your mits from melting when your shredding serious gnar. With their beveled edges and self lubricating material, the puck glides effortlessly across the pavement, keeping your hands from getting hung up on the unpredictabilities of the road. Gear up with the best, acquire Ojoom. The Rayne V2 High Society Slide Gloves are classy skate to a prom or wedding kind of glove. Golf glove fit, work glove durability. Perforated Deer Skin Leather fingers and Cuff help prevent sweaty hands! Comfortable, secure Neoprene cuff enclosure and industrial grade Velcro means they wear just like you want them. Over the past couple of years Sector 9 learned a lot about the ins and outs of a good slide glove and the new Sector 9 Driver II Black Slide Gloves are the culmination of their experience. Seams have been moved and adjusted, leather perforated and pucks reshaped for performance. You name it and they threw it in there. Lucky you! Over the past couple of years Sector 9 learned a lot about the ins and outs of a good slide glove and the new Driver Slide Glove is the culmination of their experience. Seams have been moved and adjusted, leather perforated and pucks reshaped for performance. You name it and they threw it in there. Louis Pilloni is known for his uncanny ability to skate down a hill with no hands down, but sometimes the road is just way to gnarly to not use them. That’s why Louis has got himself some pro model gloves to share with the world! And they come with a little bag in case you really want to go no-hands style!!! The Sector 9 Rush Cosmos Slide Gloves are super light weight and breathable. These are the most affordable and softest of the slide gloves, making them extremely comfortable while skating or cleaning the house. Don’t worry, your finger tips are still protected. Remember kids, follow proper sliding etiquette! Keep your weight on the puck and don’t let those fingers touch the rushing pavement! Follow these rules and these comfortable gloves will last you as long as you need. The gloves come complete with palm pucks and are ready to use out of the package. The Sector 9 Rush Flamingo Gloves are super light weight and breathable. These are the most affordable and softest of the slide gloves, making them extremely comfortable while skating or cleaning the house. Don’t worry, your finger tips are still protected. Remember kids, follow proper sliding etiquette! Keep your weight on the puck and don’t let those fingers touch the rushing pavement! Follow these rules and these comfortable gloves will last you as long as you need. The gloves come complete with palm pucks and are ready to use out of the package. The Sector 9 Rush Pineapple Slide Gloves are super light weight and breathable. These are the most affordable and softest of the slide gloves, making them extremely comfortable while skating or cleaning the house. Don’t worry, your finger tips are still protected. Remember kids, follow proper sliding etiquette! Keep your weight on the puck and don’t let those fingers touch the rushing pavement! Follow these rules and these comfortable gloves will last you as long as you need. The gloves come complete with palm pucks and are ready to use out of the package. Reinforced with high quality leather on the palm and fingers, and Kevlar thumbs ensure a long lasting, lightweight skateboard glove. Reflective piping on the knuckles and back of the hand enhance visibility to other road users in low light situations. Stretch paneling means a perfect fit without any compromise in comfort or dexterity. Timeship Ragdoll Red/White Gloves will outlast any other skateboard glove on the market! Highest quality leather and Kevlar thumbs. Utility Black Slide Pucks are some of the longest lasting pucks you can get and the best part? They’re Australian made! Utility Yellow Slide Pucks are some of the longest lasting pucks you can get and the best part? They’re Australian made!